Curtis H. Stout and engineers Lucien T. Vivien, Jr. & Associates also lit the park's Gumbel Memorial Fountain. 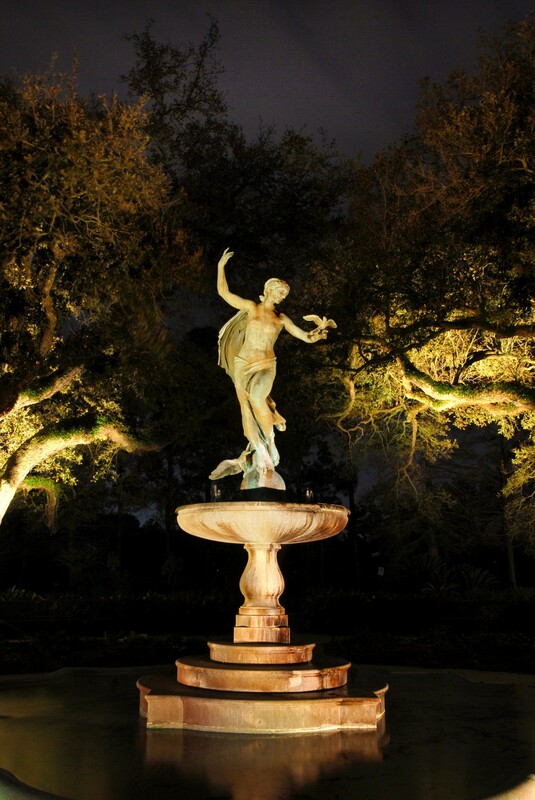 The firms used a range of Lumenbeam RGBW luminaires to accent the fountain and the live oaks that frame it. 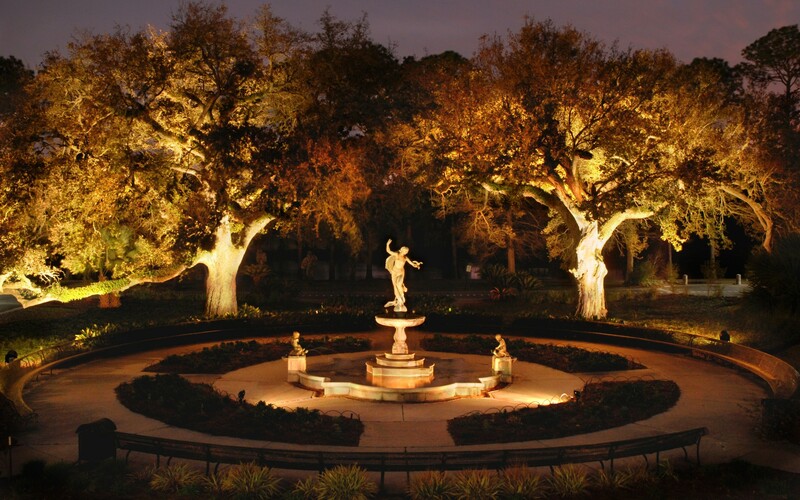 Lumenfacade luminaires were used to illuminate the main St. Charles entrance of Audubon Park in New Orleans. RGBW extends the color palette, heightening the drama of the architecture and natural landscape. Designer: Curtis H. Stout Inc.
Lumenbeam and Lumenfacade RGBW luminaires bring dynamic color to the St. Charles entrance of Audubon Park in New Orleans. Lumenpulse was the best choice, not only for the performance and sizes of their fixtures, but also for the solid construction of their products, which we believe will stand up to the elements and any potential vandalism. 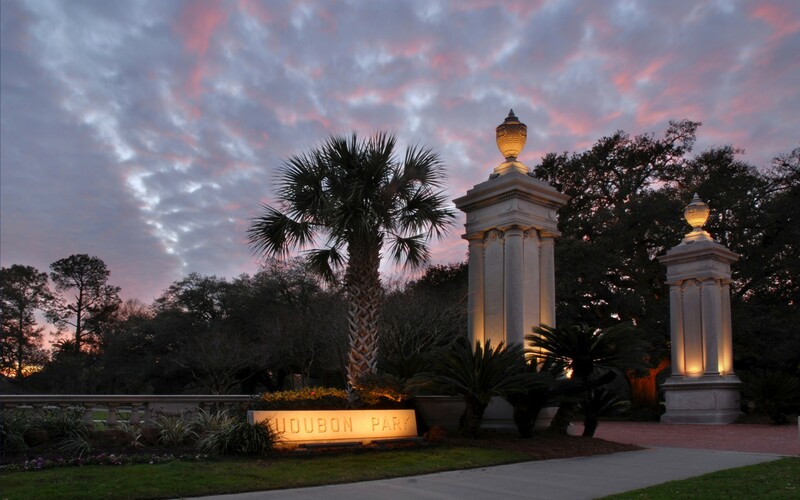 Located across the street from Tulane University, the main St. Charles Ave. entrance to New Orleans' Audubon Park is a signature location in the city. However, the popular columned entrance (and it's Gumbel Memorial Fountain), had never before been lit at night. To correct this oversight, the Audubon Commission, which oversees the park, reached out to lighting specialists Curtis H. Stout and engineers Lucien T. Vivien, Jr. & Associates. "The project's goal was to call out the columns, fountain, and live oak trees - but discreetly," said Jerry Sarradet, Curtis H. Stout's New Orleans branch manager. 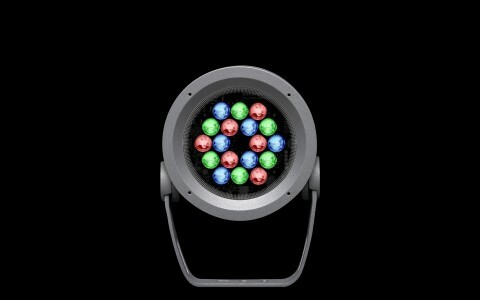 "The major challenge was in developing a dramatic lighting design where the fixtures wouldn't be seen." 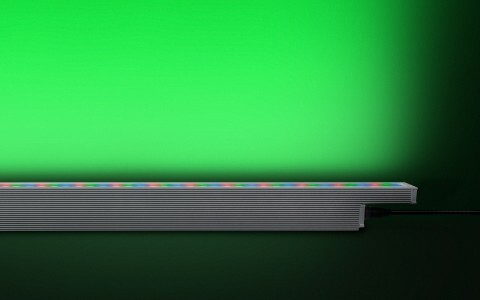 "Lumenpulse was the best choice, not only for the performance and sizes of their fixtures, but also for the solid construction of their products, which we believe will stand up to the elements and any potential vandalism," Sarradet said. 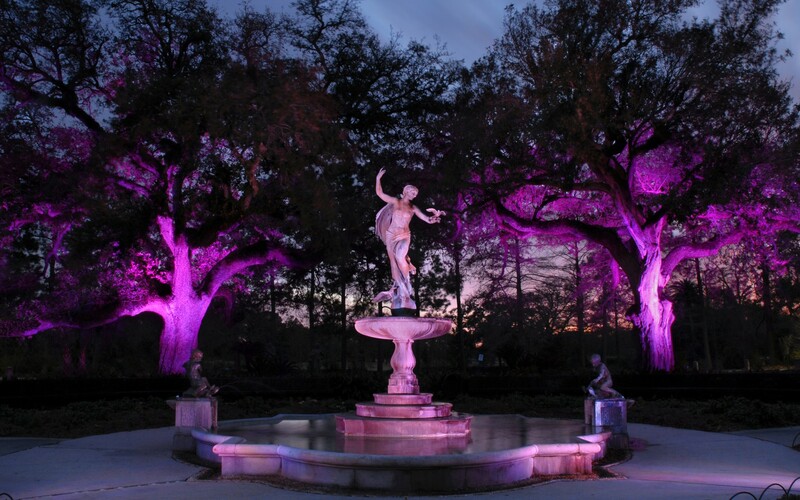 To highlight the fountain and the live oak trees that frame it, the firms used Lumenbeam Small, Medium, Large, and XLarge RGBW fixtures. 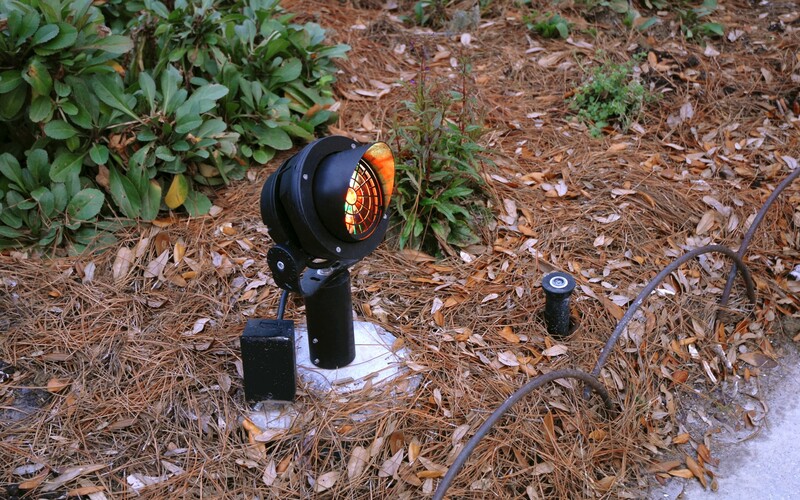 Discreetly mounted to concrete bases facing the trees and on either side of the fountain, the RGBW luminaires extend the palette of available colors, increasing flexibility and heightening the drama of the architecture and natural landscape. "They really call attention to the beautiful live oaks," Sarradet said, while maintaining the required low profile. 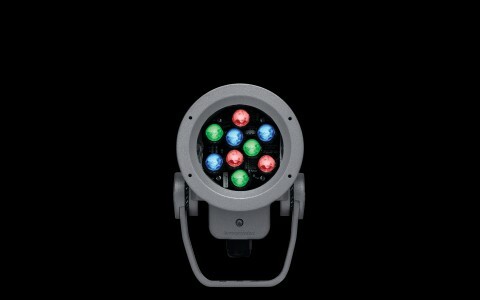 "Other than the sign lights, none of the fixtures are visible from the street." Lumenfaçade luminaires were then chosen to illuminate the columns and main entrance sign. One-foot Lumenfacade fixtures were installed at the base of the column's four sides and just below its decorative vases, bringing out textures and details. Four-foot Lumenfacade luminaires were then used to wallwash the sign, providing bright, even illumination - an effect that is as important for way-finding as it is for aesthetics. "It's a highly used entrance in the heart of uptown New Orleans, but it had no nighttime presence at all," Sarradet said, adding that public reaction was immediate. "It was phenomenal. Even on the night of the commissioning, pedestrians were stopping and taking pictures. This was truly a collaborative effort involving input from Audubon personnel as well as the design team."